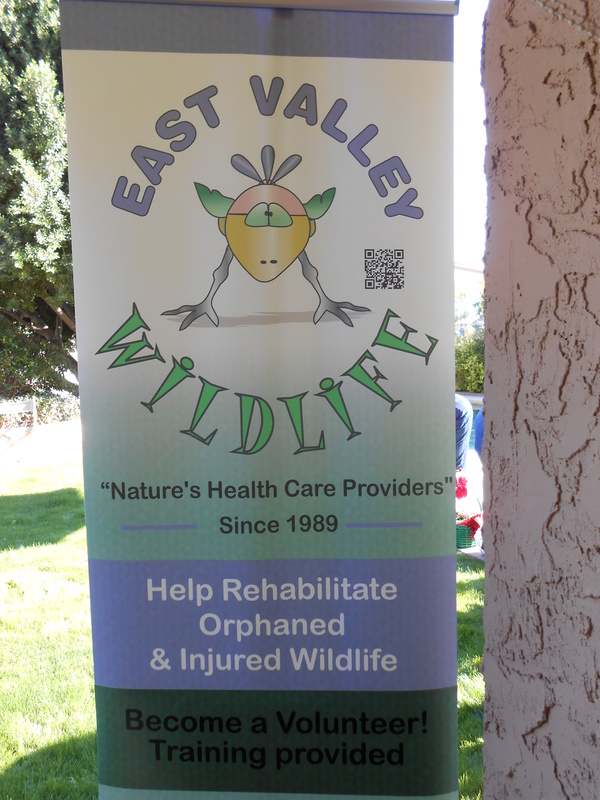 East Valley Wildlife is a registered not for profit with a Board of Directors. Board meetings are held during the year to deal with the weighty issues of running an all- volunteer animal rescue and rehabilitation group. The next Board Meeting is scheduled for Sunday, Feb. 17 at the home of the Director of EVW. Be a Philanthropist For Free! There is nothing like the great feeling of being a philanthropist, giving oodles of cash the charity of your choosing. If I ever hit the lottery I have a short list of my own fav charities! But now you can get that good feeling simply by clicking a button….and it will not cost you anything. The animalrescuesite.com is a website that offers some wonderful stories about rescued animals of all kinds…dogs, cats, bunnies, birds and even more exotic domesticated species. By clicking the big blue button on the website (to tell the advertisers that you have visited the site) a donation is made to the site (shown as a portion of a bowl of animal food). The site presumably gets its revenue from its advertisers…of which there are many. It is also a wonderful place to click and to buy some neat “animal” related items, everything from T-shirts with cute logos, fluffy slippers, jewelry, household items…actually the list is endless. I like to do my holiday shopping from the website. There are often great special deals along with free gifts and sometimes free shipping. So check it out the next time you you are online….like NOW…and feel good that each click sends a bowl of food to a needy animal. Go to www.animalrescuesite.com to find out more. Just when I had written that grant awards for non profit animal rescue groups were few and far between, lo and behold into my email box drops another grant award opportunity. This time it is an organization called “Maddie’s Fund” which is offering grant money (in unspecified amounts) to animal welfare organizations. You can visit their website to learn more about Maddie’s Fund, but in brief it is a foundation to help and promote “no kill shelters”. The grant awards are for medical equipment for dog and cat shelters. Since East Valley Wildlife is niether a dog nor a cat rescue shelter, we would not be eligible to apply, but perhaps some of our readers can pass this information on. Every once in a while there lands in my email box some grant information that I think would be good to share with our blog readers. This time it is a grant funding opportunity offered by the American Humane Association. The grants are called “Second Chance” and are in the amount of $2,000 for each grant. This is a very specific grant for the medical treatment of animal victims of abuse. There is another proviso that the grant is for non profit organizations that will provide/arrange for the medical care and that the medical care will then make the animal capable of being placed for adoption. You can go to the American Humane Associaton to learn more about their grant funding rules and regulations. Typically such “Animal Welfare” grants are for dogs, cats, horses and such, but this grant does not seem to be very specific about the species – it just states “animal”. The RFP – or Request for Proposal – does have a deadline…most grants do, others are offered throughout the year. If you are a novice at how to apply for a grant, then before you send an application, make sure you learn about the organization or company that is offering the grant money and read the Request For Proposal information carefully. Most grant providers require a minimum of information, e.g. name of not for profit that is requesting the funds; the names of Directors; proof that the organization is a non profit;a statement of how long the organization has been in existence; statement of what work the organization performs; the number of employees/volunteers; often some financial information; a statement of how the funds will be used…etc. Well, you get the idea. So, if you want to apply for grant money, be prepared in advance with the necessary facts. If you would like to get information delivered to your own email address about future grant opportunties, you can sign up for various grant provider web sites, some are free, some are not. A good one that is free is PND RFP Bulletin. Alas, my experience has been that there are not a multitude of grant money opportunties for “Animal Welfare” as compared, for example with grants for “Education”. So, if you are an animal welfare group and want to apply for grant funding, stay alert focussed and prepared…you never know when a grant opporunity might come. Read my next blog to find out how to get some great FREE information that will give your non profit a “Marketing Boost”. East Valley Wildlife is a group of volunteers who work from their homes to help in the rescue, rehabilitation and release of native birds and small mammals. We are a non profit organization anad our volunteers also attens events to educate the public about our work as well as teaching children to cherish our native wildlife heritage. There is also a group of volunteers who work with waterfowl and rescue domestic species of ducks and place them in new homes. We recently were able to purchase new signage for our traveling display. The funds that are contributed go 100% toward the work of our organization. We purchase medical supplies used in rehabilitation work and food for the “critters” that are rescued. We support a website to educate people in what to do if they find an injured bird or mammal. We also refer those species that we do not handle, e.g. hummingbirds and larger mammals, to other organizations throughout the valley. 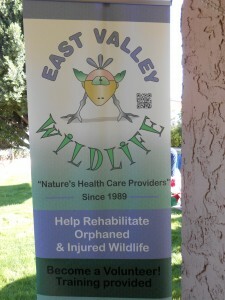 Please, if you have arrived at this blog site directly, go to our website www.eastvalleywildlife.org to find out more about the work that we have been doing in the Valley. 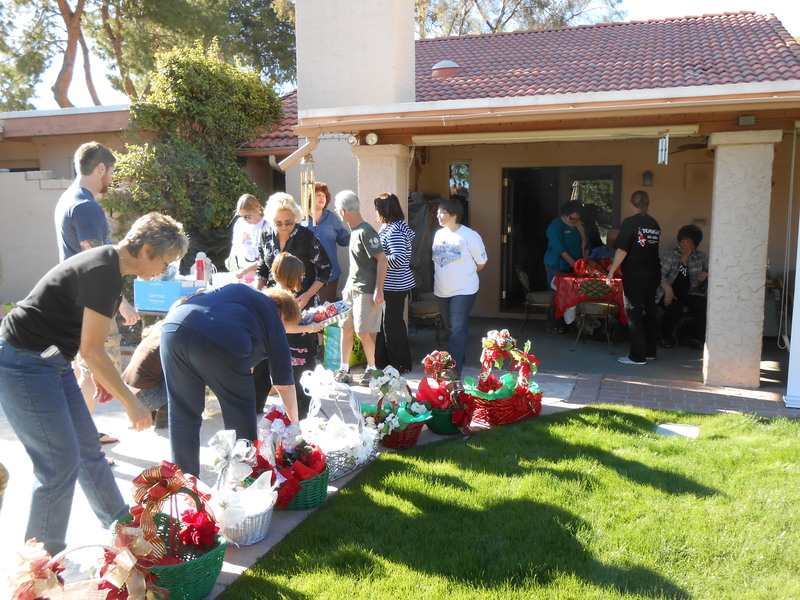 Here is another photo of our volunteers….hard at work “stuffing” Christmas baskets with homemade goodies. The “transport elves” then deliver the beautiful one-of-a-kind baskets to our special supporters who give us so much help througout the year. Well, it seems like a long time since Christmas! The flu season arrived in the new year and deposited misery to my house for a month. But we are again on track and thought you would enjoy photos of the Christmas Luncheon. Each year East Valley Wildlife volunteers gather at the house of Patti and have a great potluck meal and good comraderie. The 2012 luncheon was no exception and we had a special treat with the attendance of Lisa and a few of her more exotic animals. Lise holds special licenses and permits to have the animals as “ambassadors” to teach children about the various species. Lisa’s Creatures are not available privately, but appear through the Chandler parks and Recreations Programs. 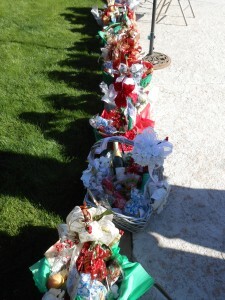 One of the purposes of the luncheon is also to make special baskets which are then delivered to our supporters who give us so much help throughout the year.